From the rim of the Grand Canyon in Arizona to the crown of the Statue of Liberty in New York, to the peaks of Mount Denali in Alaska, America’s public lands include some of the most iconic landscapes and treasured places in the world. The Subcommittee on National Parks, Forests, and Public Lands oversees this collection of crown jewels, and the federal agencies tasked with their protection. National Park Service: Founded in 1916 and manages more than 85 million acres in 419 units. In 2014, the National Park Service welcomed 292 million visitors, employed 21,000 people and managed an annual budget of almost $3 billion. Forest Service: Founded in 1905 and currently manages 193 million acres in 155 national forests and 20 national grasslands – roughly 30% of all federal land. The Forest Service employs 30,000 people and manages an annual budget of roughly $6 billion. Bureau of Land Management: Founded in 1946 and manages 245 million surface and 700 million subsurface acres – roughly 40% of all federal land. The Bureau of Land Management manages 380 recreational sites, 21 national conservation areas, 16 national monuments and vast areas of open public land. It employs approximately 10,000 people and manages an annual budget of roughly $1 billion. On February 26, 2019, Chair Raúl M. Grijalva (D-Ariz.) introduced the Grand Canyon Centennial Protection Act– a bill that protects approximately 1 million acres north and south of Grand Canyon National Park from new mining activities, preventing future damage to the region’s exceptional resources. A map of the proposed protected area is available here. What Does a Permanent Mineral Withdrawal Mean? In 2012, then-Secretary of the Interior Ken Salazar announced a 20-year moratorium on new uranium mining claims on more than 1 million acres of public land surrounding the Grand Canyon. Despite these protections, mining industry interests, particularly uranium producers, and the Trump administration have attempted to overthrow the ban and reintroduce the threat of extraction into this irreplaceable landscape. To provide permanent protections for one of our nation’s most iconic landscapes, this bill builds upon the existing protections by making the mineral withdrawal permanent. The bill formally removes the moratorium area from the jurisdiction of the Mining Law of 1872 and the Mineral Leasing Act – barring new claims for locatable minerals such as uranium and precious metals, and new leases for leasable materials such as oil and coal. Although existing claims inside the moratorium area will remain, owners must perform a validity determination to keep them, requiring a demonstration that their claim contains extractable mineral deposits in a concentration that can be mined profitably. Uranium mining has left a toxic legacy in the Grand Canyon region, polluting soils, aquifers, and drinking water. Numerous abandoned uranium mines still litter the region, with over 500 mines on the Navajo Nation alone. The Grand Canyon Centennial Protection Act will ban new mining claims on approximately 1 million acres around Grand Canyon National Park, to prevent new mining interests from further degrading the landscape and impacting local communities.By permanently withdrawing the moratorium area from new mineral claims, Chair Grijalva’s proposal will protect many of Northern Arizona’s most sacred Native American sites and ecologically sensitive areas as well as the Colorado River watershed, which supplies drinking water for nearly 30 million people. Is This Good for the Economy? The Grand Canyon National Park is a key driver of the regional economy, and increased pollution in the watershed risks rural livelihoods. In 2017, the Grand Canyon National Park employed 382 people and supported an additional 9,420 jobs in gateway communities, 7,222 of them directly supported by the park. In comparison, an economic analysis estimated that if the Grand Canyon moratorium did not exist, the uranium-mining industry could potentially support 636 jobs in the region. Beyond job creation, visitors to the Grand Canyon National Park contributed $938 million to gateway economies in 2017 and helped generate $160 million in local and state tax revenue in 2016. On the other hand, an economic analysis conducted prior to the mining ban estimated that uranium mining would only generate approximately $22.9 million annually for federal, state, and local governments. The study also found that the recoverable uranium resources would likely be exhausted within a 20-year period. Do Tribes Support the Proposal? Tribal leaders overwhelmingly support the Grijalva plan. You can read their resolutions and letters of support here. Who Else Supports the Designation? Members of the City Council of Flagstaff passed a resolution supporting Chair Grijalva’s proposal. A group of 20 faith leaders sent a letter to Acting Secretary of the Interior David Bernhardt urging them to support a continued ban on uranium mining around the Grand Canyon. A coalition comprised of the National Congress of American Indians, Center for Biological Diversity, Earthjustice, Grand Canyon Trust, Grand Canyon Wildlands Council, Haul No!, National Parks Conservation Association, Sierra Club, The Wilderness Society, and the Wildlands Network also sent Chair Grijalva a letter supporting the proposal. Is The Idea Popular With the Public? A 2018 poll found that 78 percent of Arizona voters support a permanent ban on mining in order to protect Grand Canyon National Park and the Colorado River, with 96 percent saying that “keeping our public lands and waters healthy both benefits our economy and quality of life” in Arizona. 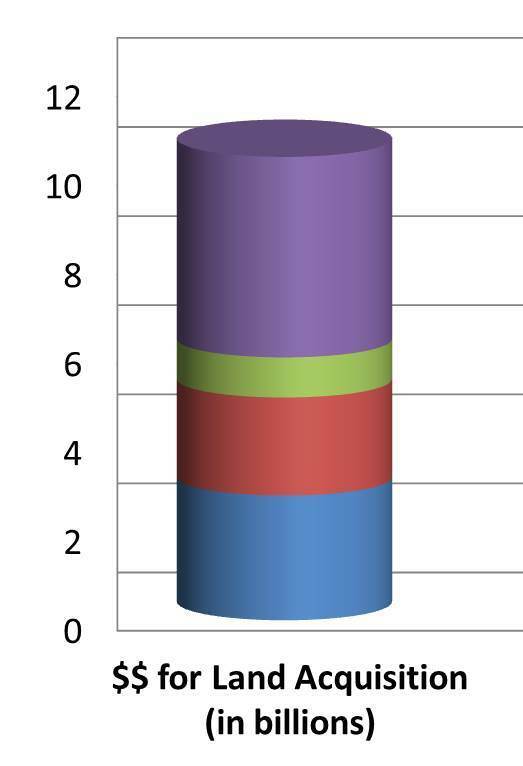 This support is strong across political parties, demographic groups and geographical areas, with majority support in every major subgroup included in the poll. This support stems from a widespread belief that more needs to be done to protect the land, air and water around Grand Canyon National Park. Almost half (48%) say they would have a “more favorable” opinion of an elected official who supports continuing the ban. What Is the Media Saying About It? The proposal has been supported in the Arizona Daily Star, the Washington Post and many other outlets. Tribal leaders and communities across the region – joined by faith leaders and outdoors enthusiasts – support the permanent mineral withdraw. They all agree: It’s time to provide lasting protections for one of the crown jewels of our National Park System. The real economic engine fueling many communities is the recreation economy. The Outdoor Industry Association's economic report estimates that outdoor recreation creates $646 billion in direct consumer spending and $80 billion in federal, state, and local taxes (bigger than the pharmaceutical or automobile industry). According to the National Park Service, the national park system also generates $10 of economic activity for every $1 invested. Responsible land management practices preserve public lands for future generations and have little to no impact on recreation opportunities. Annual recreation visits to National Parks have increased by more than 75,000,000 visits since 1979, a nearly 40% increase, according the National Park Service's 2014 annual visitation summary report. Committee Democrats support reauthorization of the Federal Lands Recreation Enhancement Act (FLREA). FLREA improves recreation and visitor services, keeping most fees on-site for improvements that visitor’s desire, and makes recreation sites more accessible. For example, FLREA establishes a single national pass that can be used across recreation sites managed by all four land management agencies. Wilderness areas belong to all Americans and encompass some of our most breathtaking places: snow-capped mountains, giant redwoods, roaring rivers, and wildflower-filled deserts. The National Wilderness Preservation System also provides vital habitat to birds, animals, and plants. You might witness an endangered California condor soaring high above the San Rafael Wilderness in California, or catch a glimpse of an American alligator in the St. Marks Wilderness in Florida. Spend $646 billion annually which supports 6.1 million American jobs in the Outdoor Industry, according to the 2012 Outdoor Recreation Economy report. Contribute to both local and national economies by contributing $39.9 billion in federal tax revenue, and $39.7 billion in state/local tax revenue. Increase employment, between 1970 and 2010 employment increased by 297% in rural counties in the West with land bases that are more than 20% protected federal land, and 345% in counties that are more than 30% protected lands, according to the Headwaters Economics 2012 report. Urban communities value greenery. As our society continues to urbanize, many communities place a greater value on having scenic backdrops to their homes and nearby open space for recreation. According to a recent study, private homes near parks, wilderness and other protected areas can have property values 20% higher than similar properties elsewhere. In addition, protecting lands as wilderness also helps maintain healthy, intact ecosystems that offer valuable services. Ecosystem services provide billions of dollars of benefits to the American people, from forests that clean the air we breathe and filter our drinking water, to wetlands that provide stormwater capture. Wilderness is a bipartisan tradition. Wilderness lands safeguard our nation's cultural heritage including Native American sacred sites and vestiges of early American history. Numerous wilderness areas including the Gila wilderness in New Mexico contain Native American petroglyphs and other areas of significance. Wilderness is a special designation reserved for our wildest lands. 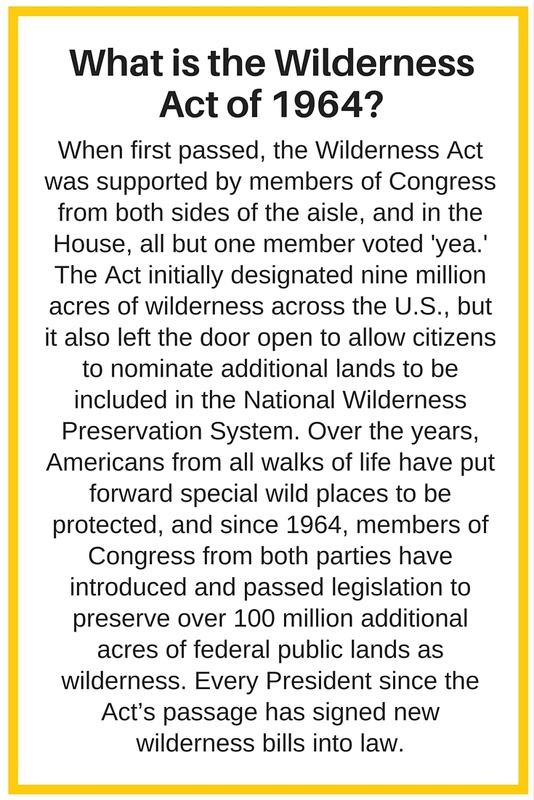 Only Congress can designate wilderness areas under the Wilderness Act of 1964. When a new wilderness bill is passed, the lands are protected in perpetuity for current and future generations. Wilderness is considered the strongest kind of protection that federal public lands can receive because it protects lands from development, new mining claims, and mechanized uses while continuing to allow hiking, camping, hunting, and horse-back riding. Wilderness is also considered the most durable land protection because once designated, Congress has never de-designated it (except to make a technical boundary correction). There’s more wilderness out there…and it’s being held hostage. Unfortunately, in recent years, the bipartisan tradition of wilderness has begun to disintegrate. Despite broad local support, wilderness bills have been largely snubbed under the Republican-controlled Congress. Although a handful of wilderness bills were passed at the end of 2014, the last time a comprehensive land conservation package passed was in 2009. Many wilderness bills that have been languishing for sometimes more than a decade have never even been granted a hearing. Recent requests for wilderness hearings have been outright denied by the Majority. Each of these bills would add much needed protections to unique wild lands around the country, and each of these bills has a cadre of local citizens and supporters who are calling for it to pass. With climate change and the increasing urbanization of our communities, it is more important than ever that we set aside wild areas for future generations to enjoy. Wilderness is an idea broadly supported by Americans. The results of a national survey indicate that protecting air quality, water quality, wildlife habitat, unique wild plant and animal species, and being able to pass wilderness on to future generations are all consistently rated as the top five most important benefits of protected federal lands. According to the Colorado College State of the Rockies Project, two-thirds of Western voters believe the current laws protecting land, air, and water should be strengthened, or at least better enforced. 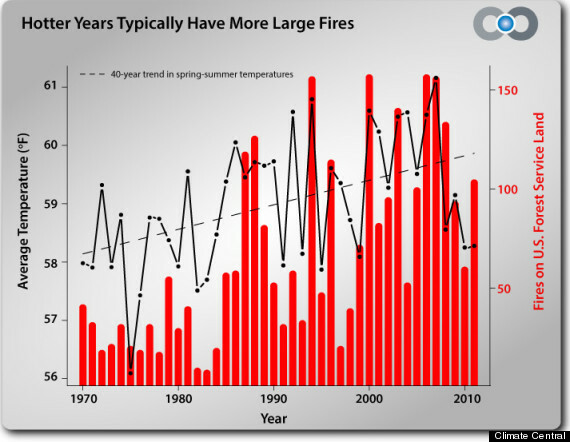 The increase in the severity and frequency of wildfires is driven by climate change. Since 1986, longer, warmer summers have resulted in a fourfold increase of major wildfires and a sixfold increase in the area of forest burned, compared to the period from 1970 to 1986, according to an Oregon State University study. A similarly sharp increase in temperature and wildfire activity has been reported in Canada during the same period. Since 1970, the wildfire season in the western United States has increased by 78 days and the average burn duration of large fires has increased from 7.5 to 37.1 days, according to a study. This increased wildfire trend correlates with an increase in spring and summer temperatures by ~0.9°C and a 1- to 4- week earlier melting of mountain snowpack. In 2012, a White House report stated that wildfires burned 9.2 million acres across eight states, reducing air quality, damaging property and costing more than $1 billion. The cost of fire suppression and mitigation is the main challenge faced by federal and state agencies battling wildfires. According to a Headwater Economics report, the cost of wildfire protection has more than doubled in the past 15 years, and over 50% of the budget for the US Forest Service is consumed by firefighting. Currently, 1% of wildland fires, which are considered catastrophic, are responsible for 30% of the Forest Service’s fire suppression costs. The remaining 70% of suppression costs are generated by the other 99% of fires. In order to address the costs associated with the one percent of fires, the FY 2016 President’s Budget proposes a Fire Suppression Cap Adjustment which would treat catastrophic wildland fires as disasters, and fund their suppression costs outside of the discretionary budget appropriation of the Forest Service. Under the proposed cap adjustment, $855 million would be available to meet suppression costs above the base appropriation. The Fire Suppression Cap Adjustment funds would be accessed by a Secretarial declaration of need and an imminent end of the appropriated discretionary funds. With the number of wildfires projected to double in areas of the West by 2050, the cost of battling wildfires will continue to increase. Currently, 1% of wildland fires, which are considered catastrophic, are responsible for 30% of the Forest Service’s fire suppression costs. The remaining 70% of suppression costs are generated by the other 99% of fires. The costs of these large fires often forces the Interior and Agriculture Departments to transfer money from non-suppression. Known as “fire borrowing” or fire transfers”, this activity draws money away for programs intended to reduce the risk of large, catastrophic wildfire risk. Congress must address how we pay for wildfire suppression in order to safeguard accounts meant to improve forest health and mitigate wildfire risk. The Stewardship Contracting and Good Neighbor Authorities are critical land management tools that not only improve the health of our forests and reduce the threat of wildfire, but also support our local economies and create jobs for our communities. Democrats supported the permanent reauthorization of both programs in the Farm Bill. Committee Democrats support the Collaborative Landscape Restoration Program, which facilitates the reduction of wildfire management costs by reestablishing natural fire regimes and reduce the risk of uncharacteristic wildfire. Committee Democrats support President Obama’s proposal to modify the funding strategy for wildfire suppression. In order to address rising costs of wildfire, the FY 2016 President’s Budget proposes funding wildfire suppression at 70 percent of the 10-year average of fire suppression costs. Additionally, the proposal recommends Disaster Cap Adjustment of up to $855 million to address funding needs above the initial allocation. The disaster cap adjustment would allow Congress to provide funding to address bigger than average wildfire seasons through supplemental appropriations that are not subject to discretionary spending limits set by the Budget Control Act of 2011. LWCF has protected more than 5 million acres and strengthens the ability of land management agencies to manage and provide access to federal, state, and local lands. Congress can appropriate up to $900 million annually from the receipts to fund the account. That has only occurred twice. LWCF is the principal source of funds for federal land acquisition by the four land management agencies. (Bureau of Land Management, Forest Service, Fish and Wild Life Service, and National Park Service) Portions or all of many of the nation’s parks, landscapes, and forests were acquired via LWCF. 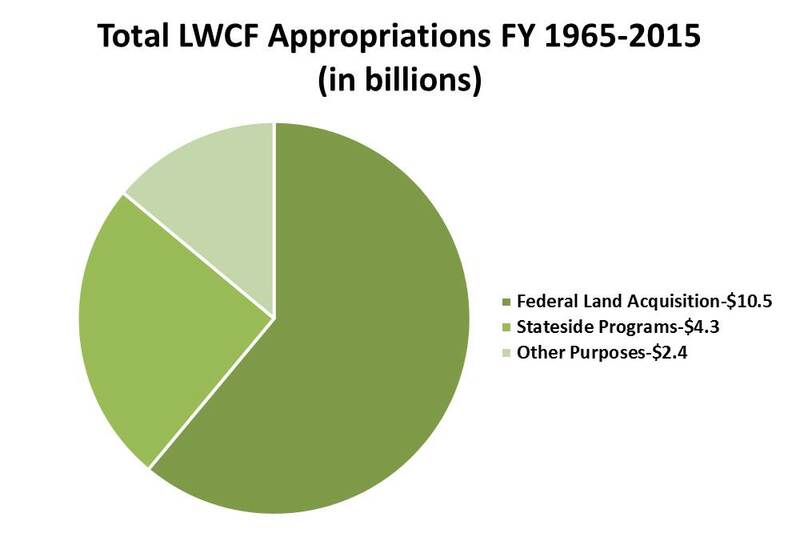 Since funding for LWCF comes primarily from energy revenues, no monies come out of the federal budget. It is Congress’ responsibility to appropriate the funds annually. Over the past 50 years, LWCF has provided over $17.1 billion toward outdoor recreation planning, state and federal lands and waters acquisition; state recreational facilities; and other purposes. There has been $37.1 billion credited to LWCF, leaving an unappropriated balance of $20 billion in the fund. The State Assistance Program has issued over $3 billion in grants and leveraged over $7 billion in non-federal matching funds. A poll indicates that 88% of voters support continuing to set aside offshore oil and gas drilling fees into the LWCF and 85% of Americans want LWCF to be fully funded. With Hammond pardons, did Donald Trump write a blank check to anti-government extremists? Commentary: When Americans look at a map of the US, they see natural wonders. When Trump looks, he sees unrealized industry profits.